How to NATURALLY Make your Metabolism Fast Fast Fast! We all know that one person who eats a lot and never gains weight! Do you feel that the older you get, the less you eat, the more weight you gain? You are not alone, and we have the solution! In this part 1, we’ll explain how to speed up your metabolism and what types of meals can help you educate and maintain a good metabolism. Every coin has two sides, and the flip side of speeding up your metabolism is slowing it down. If you are not pooping at least once a day, you might be doing things that decelerate your metabolism without even realizing it! Eating Poorly – Treats are alright. Just make sure they are organic, healthy, natural foods. Avoid high processed fat foods. We know they taste glorious, so learn how to make them yourself with better ingredients. Not Enough Sleep – If your body is exhausted then the efficiency with which it burns calories goes down the toilet. A well-rested body is more efficient. And setting alarms when it’s bed time is just common sense. Being Stressed Out – Stress causes high levels of a hormone called cortisol in your body, which leads to belly fat. Exercise and enough sleep make cortisol levels in the body drop. For high-stress lifestyles, we recommend a yearly or quarterly major holistic detox package. Dieting –Strict dieting can lead to lower metabolism. Avoid fad diets and super low-calorie diets. 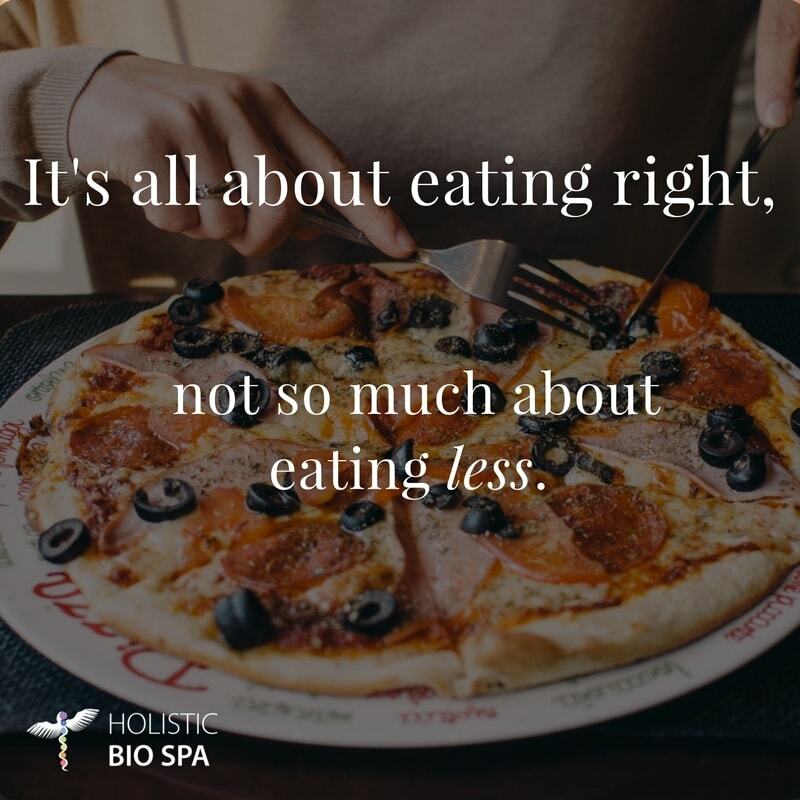 Low-calorie diets cause your body to switch to starvation mode, your metabolism slows down to keep you from burning too many calories, then when you eat again your body stores the calories as fat. Fad diets may work in the short-term, but the true path to a healthier you is to improve your overall eating habits at a comfortable pace. A Toxic Body – The accumulation of toxins in the body slows down the metabolism because the body has to work extra hard to eliminate these toxins on a daily basis. Again, we recommend a yearly or quarterly major holistic detox package if you live in a city or have a high-demand job. Some people are the victims of an under-active thyroid, adrenal burnout, or unfortunate family genetics that lead to weight gain, but there are still ways to speed up your metabolism, even if you are genetically predisposed to carrying more weight than you would like. A healthy diet is a healthy you. You’ve heard the expression, “you are what you eat”. It’s true. We fuel and build our bodies with the foods we eat. You are what you eat. Eat, fresh, vibrant food and you will become fresh and vibrant. A good variety in your diet will keep your life simple and fun. Eating, detoxing, and exercising is how you nurture a healthy metabolism. In the next article, we will delve more into the ultimate undisputed NATURAL hacks to speed up your metabolism… you don’t want to miss it! Your turn, what is your biggest barrier to eating as healthy as you would like? The most honest comments may be part of our next blog articles. 3 Responses to "How to NATURALLY Make your Metabolism Faster than Speedy Gonzalez"
Thanks for the motivational tips to keep healthy. my health needs as they do change when aging. Of course, Sherry, we would be glad to help guide you in your path to a healthier you. Like Julie (one of our dear patients) said on our homepage, “it’s never too late to step up and start taking good care of yourself”. It would be a pleasure to meet you too. Do you have a specific health concern that you’d like to share? We can private message you to help point in the right direction with holistic health solutions to optimize your body and mind. PS. Insiders tip: all our comprehensive holistic health packages will be at a 20% cash discount starting November! Send us an email at info@holistic-bio-spa.com or give us a call at +52 (322) 221 1607 to book your next healing vacation in advance.